You can reactivate operatories, which correspond to columns on your schedule, that were previously inactivated. When you reactivate an operatory, it can again be displayed on the schedule. 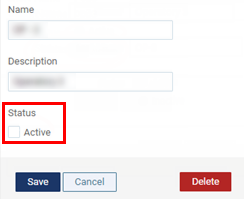 On a location's Operatories page, select the Include Inactive check box to display all inactive operatories in the list. Under Status, select the Active check box.